While there are many fantastic online websites for preschoolers, they mostly tend to be learning games with no particular sequence or direction. And I use the concept of "learning" loosely, since many of them are primarily games but involve some educational elements. The Time4Learning preschool program combines technology, animated characters, original stories and fun music to inspire a love of learning in the littlest e-learners. ...When they're logged in to Time4Learning, preschoolers won't just sit and watch; they'll laugh, learn, participate and explore. They'll sing along with Ed Mouse on the farm and get up and exercise with a group of kids. They'll yell out numbers to an octopus under the sea and politely help a mountain climber scale Manners Mountain. Children can label their virtual school supplies box and library card with their own name and plan their week with a customizable weekly planner. You'll see smiles and hear giggles that let you know that your children are having fun and when they start talking about habitats and tertiary colors, you'll know it's more than just fun. For more info, you can check out their preschool website with its demos are ask questions on their parents discussion group. The Educator Resources section of www.fcatexplorer. make the most of FCAT Explorer and Focus. Fore more info on Florida FCAT preparation try the Time4learning site or FCAT Explorer. Hi, I'm not sure if I'm a fan of standardized testing or not. To be honest, I know I'm not. Who likes testing? Nevertheless, I'd like my kids to do well. I'm not a big fan of last-minute test prep are spending a lot of time worrying about test-taking tricks. I'm more a believer in the idea that kids' scores will reflect their skills so they should build skills and then not worry about the tests. Alaska Terra Nova - Nebraska Nebraska Content Standards L.E.A.R.N.S. I just found and am really enjoying this great vocabulary and spelling website. I'm using it to help my kids get back into the academic mind set this August. Contractions - You can build lists using words like: I’ll, we’ll, shouldn’t, and they’re. There are lists of what contractions SpellingCity.com supports. Possessives - SpellingCity has added some sample possessive forms of nouns, both plural and singular, for spelling and grammar practice. For example: aunt, aunts, aunt's, aunts', boy, boys, boy's, boys', lady, ladies, lady's, ladies', doctor, doctors, doctor's, doctors'. 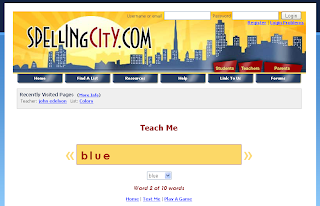 As background, SpellingCity has always included both the singular and plural forms of nouns and the the forms of verbs (ex play, playing, played). Dolch Words - This collection of Dolch or Sight words is perennially useful. There is both background information and lists ready-to-use. Compound Words - Kids love studying compound words. Teachers love teaching them. Does your school have a Compound Word Day? It should! Sound Alike Words or Homophones - All students and many adults benefit from practice distinguishing the right spelling and usage of its and it's; they're, there, and their; and to, too, and two. Word Confusion - This article reviews homophones, homonyms, homographs, and synonyms. Need a quick reminder? Here it is. SpellingCity.com has two articles on the importance of spelling to building successful readers and writers: The Importance of Spelling and Research on Spelling Automaticity. The parenting bible is a concept that is near and dear to my heart. For years, I have wanted to develop this concept. I now have the domain, the blog, and I'm almost ready to go. One detail, where am I going to get the time? On that very appropriate note, I'll leave you, dear readers, for the moment with this thought. Great intentions are not so important in parenting: it's about what you actually do and say. And how you allocate your time. Yes time. The basic biblical rule is: you only got so much time. And nobody is all that sure how much they've got. Time time time. You have a baby, you blink, she leaves for college and starts having babies of her own.